This item includes the LCD, digitizer touchscreen and front housing. This Galaxy Mega 6.3 I9200 LCD Screen and Digitizer Assembly with Front Housing has a Samsung logo on the top of the front side. The marks “I9200” appears on the rear side of the Galaxy Mega 6.3 LCD and digitizer assembly. 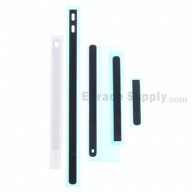 The flex cable of Samsung Galaxy Mega 6.3 LCD Assembly is very sensitive and is easily damaged. Handle carefully. The installation of this Galaxy Mega 6.3 LCD Display Assembly should be done by a qualified person. ETS is not responsible for any damage caused during installation.